Like the region's first inhabitants, the "Cat People," who made clothing from the mountain lions and panthers that they hunted, Western New Yorkers still savor the tradition of storytelling. 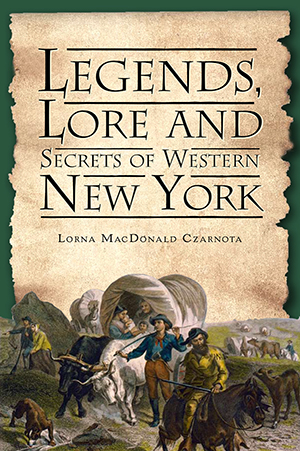 Tales such as the "Mail-Riding Mamma" of Chautauqua County, who carried both the post and her infant child above her head as she journeyed across perilously flooded creeks, and the Ossian Giant, who at age nineteen stood seven feet, six inches tall and weighed 385 pounds, are vividly narrated by Buffalo storyteller Lorna MacDonald Czarnota. Listen to the whispered legends of spirits, heroes and traitors hidden in one of New York's most captivating regions. Storyteller, author and educator Lorna MacDonald Czarnota has delighted audiences in schools, libraries, festivals and conferences throughout the United States, Canada and Ireland with traditional and original stories since 1985. Her work features historical presentations, including those on the American Civil War, the Middle Ages, the Dust Bowl and colonial America. She is a vocalist with the Blue Eagle String Band, presenting music of the Great Depression. Lorna's programs include storytelling, writing workshops and motivational presentations. She specializes in work with at-risk youth, therapeutic narrative, Celtic folklore and the use of music and song to enhance story. Her writing and recording accomplishments include Medieval Tales that Kids Can Read and Tell; “The Bleeding Heart”; The Healing Heart Communities; “One Lace Glove”; August House Book of Scary Stories; Crossroads: Stories of Choice and Empowerment; and Dancing in Dark Waters. Lorna is a recipient of the 2006 Oracle Award from the National Storytelling Network, the Hopevale Incorporated Volunteer of the Year Award and the Storytelling World Award and was nominated as a Univera, United Way Community Hero. Visit her website at www.storyhavenstudio.com.